Home > Africa > We are the solution: African women organize for land and seed sovereignty. An interview with Mariama Sonko. We are the solution: African women organize for land and seed sovereignty. An interview with Mariama Sonko. 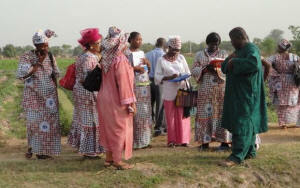 Mariama Sonko, third from right, with a women farmers’ organization. Mariama Sonko is a farmer and organizer in Casamance, Senegal. She is the National Coordinator of We Are the Solution, a campaign for food sovereignty led by rural women in West Africa. Photo courtesy of Fahamu. Mariama Sonko, third from right, with a women farmers’ organization. Photo courtesy of Fahamu.Mariama Sonko is a farmer and organizer in Casamance, Senegal. She is the National Coordinator of We Are the Solution, a campaign for food sovereignty led by rural women in West Africa.